While they are often just installed and forgotten, wireless networks have a tangible impact on our daily working lives, whether it’s keeping staff connected or giving customers trouble-free online access that keeps them coming back and spending more. Conversely, bad Wi-Fi wastes time, causes frustration, and could even mean that a small business is not getting the broadband speeds for which it is paying. So, how does a business make sure its Wi-Fi system is up to the job? First, ensure that the external connection from the Internet Service Provider (ISP) is not a problem. You can carry out a simple wireline test to check the real – not promised – broadband speed. Second, look at the environment in which the Wi-Fi system is operating. Ceilings, insulation, and proximity to devices that can cause interference (such as cordless phones and microwaves), can all interfere with the wireless signal. Third, if there is a Wi-Fi system already in place, it may be time to replace it. Many standard-issue routers from the ISP are not suited to small business demands and, if more than a couple of years old, are also probably outdated. These days, there are several different types of Wi-Fi systems and although it can seem confusing, it does not have to be a daunting task. It may sound obvious, but start by defining exactly what is needed: the number of users and devices, the surface area to be covered and what speeds are needed (apps that have video streaming are bandwidth-hungry). Next, look for a system that is easy to install and run, without needing technical expertise. Depending on the business, it may be important to choose a system that can easily expand and adapt in the future. Where customer Wi-Fi is important, choose a system that can segment into more than one Wi-Fi network, for instance, one for customers and one for the office employees. If the Wi-Fi unit is going to be very visible, its appearance could be important too, as well as flexibility over location (wall-mounted may be better). If point of sale systems, printers, and other devices need connecting, make sure the unit has Ethernet ports. Mesh networks are another useful innovation. These use multiple Wi-Fi access points – or satellites – that can be daisy-chained together to create a single network, all controlled from one original router. Performance should be consistent no matter how far away a satellite is from the main router, and when the Wi-Fi network needs to be extended, it should be easy to just add another satellite. However, not all mesh networks are created equal, because many standard mesh networks are based on sharing the Wi-Fi connection with what’s known as the backhaul, and that does impact speed and performance. Make sure to choose a tri-band mesh network, which optimizes the bandwidth available because it has a dedicated backhaul link, so there is no trade-off and, instead, the business gets the maximum bandwidth possible. Designed with small and medium sized businesses in mind, especially those that also need to offer customer Wi-Fi, the Orbi Pro ticks all of these boxes. 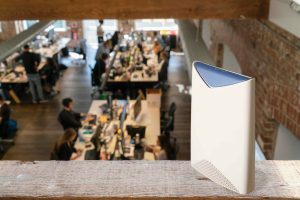 Essentially a ‘DIY Wi-Fi in a box’, the Orbi Pro can be installed and set up in just minutes, without any changes to existing equipment. It offers coverage from 5,000 up to 10,000 square feet and provides speeds of up to 223 Mpbs, compared to just 71 Mpbs from some other solutions. Three separate and secure wireless Internet networks (SSIDs) can be created and, if more users need to be supported or the coverage area increased, more satellites (up to three in total) can be quickly and easily installed, each one able to cover 2,500 square feet, with options of wall and ceiling mounting. Though ‘fit and forget’, Orbi Pro also has a simple app for checking network status, make changes or accessing support information. Wi-Fi technology has evolved a great deal and so any business that has not recently reviewed wireless options could be missing out on better speed, reliability, flexibility and ease-of-use, getting the best connectivity for which they are paying, and turning Wi-Fi into something that truly adds to the customer experience.